Charcoal samples may be submitted for Macrobotanical Identification. Please use our Submission Form to submit your samples. Please contact us with any questions about your submission. 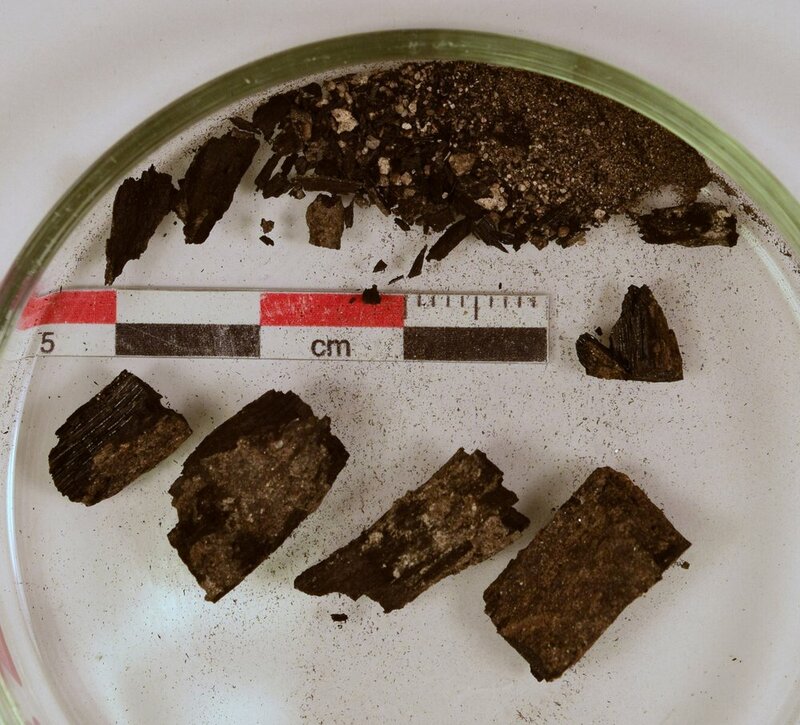 Charcoal samples undergo a chemical pretreatment protocol to remove adsorbed carbon compounds, such as humic acids, that may alter the apparent age. The Charcoal Service fees above assume submission of clean, isolated charcoal. Charcoal-rich sediments require additional physical pretreatment in order to extract charcoal from the sediment matrix, and is part of the Macrofossil Extraction Service. To avoid the additional cost of Macrofossil Extraction, use the following guide to select ideal material. Charcoal with sediment and calcite accumulation. Choosing the most appropriate sample for submission is vital to the success of analysis. Determine that the material is actually charcoal, rather than charred, fused sediment, or black mineral, such as manganese (pyrolusite). Charcoal yields readily to a metal probe and has a low density, relative to sediment clumps or minerals. Charcoal is black all the way through, and is iridescent. Charred sediment is usually mottled, with a dull appearance. Well-preserved charcoal has striated layers that indicate growth layers or rings. Some crystalline forms of manganese may superficially resemble charcoal, but are distinguishable by their higher density. Charcoal has a friable surface and readily creates a fine dust. Manganese is not friable. If such a determination is possible, select the youngest material available: twigs, cone scales, herbaceous stems, seeds, leaves, pine needles, bark, or closely-spaced outer growth rings. Avoid or remove obvious contaminants: organic growth (e.g. invasive rootlets or mold) or inorganic inclusions (e.g. sediment, iron mineral, or calcite accumulation). Rinse and/or scrape away adhered soil. Package and ship samples according to our general recommendations. "Pretreated" charcoal has been chemically treated, typically with an acid-base-acid protocol, prior to submission to DirectAMS. Please provide a brief summary of the protocol applied in the Comments section on the Submission Form.